There’s a lot to report from last week’s three transportation-related committee/commission meetings. The Pedestrian, Bike, and Motor Vehicle Commission (PBMVC) started out with another quarterly Traffic Enforcement Activity Report. I pressed Lt. Knight (again) to bring us more actionable information. You can see an example of the report and spreadsheet that is presented each quarter. It’s a lot of data, which basically just shows how much work the Traffic Enforcement team has put in. Citations go up and down based on hours worked and don’t really tell us anything about trends in dangerous activities. Instead, I argued that we need analysis of crash data that helps us pinpoint the leading causes and locations of collisions resulting in injury and loss of life. From there, we would be able to start working on interventions to address these issues. While we should be encouraged that Madison ranked third best in the nation in the recently released Dangerous by Design report, it’s still clear that pedestrian and bicyclists make up a disproportionate number of traffic fatalities in our city. This is definitely an area where we need to look to the data to guide our work. Next up at PBMVC was a motion to recommend approval of the draft Madison in Motion Sustainable Master Transportation Plan. I’ve been critical of this plan in the past, calling out the lack of specific and clearly articulated action items, lack of accountability, and absence of performance measures. Without these things, this plan is destined to collect dust on the shelf. I shared those comments again here beginning at 00:32:30. There was also a good discussion about a proposal to complete the Demetral Path connection (you can watch via the link above beginning at 01:00:00). This is an updated proposal from the one that came forward almost a year ago that would have had a significant impact on the OM Village. 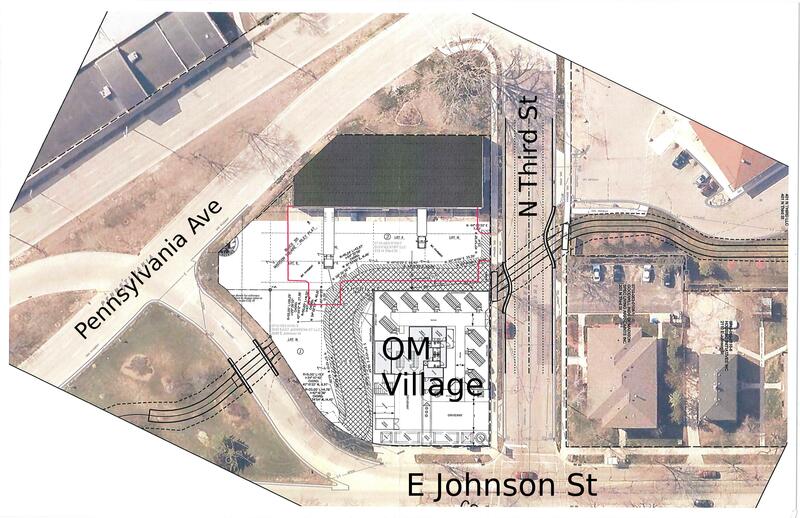 The new concept (see above) proposes to move the path through the existing parking lot of the commercial building to the north. I enthusiastically support closing this gap as it will become a major corridor for people on bikes once the bike facilities are added to E. Johnson as part of that project. However, I did ask Engineering to explore an alternate routing of this connector within the public right of way. This would save the city $300K in land acquisition costs and would avoid several problems associated with the current proposed alignment. PBMVC voted to refer the item to its February meeting and asked that Engineering develop in detail that alternate concept for further evaluation. The Transportation Ordinance Rewrite Committee meeting on Wednesday was an engaging one. This ad hoc committee has been meeting since last March to propose revisions to Madison’s current transportation ordinance and is aiming to finalize its recommendation over the next month. The main focus of the group to date has been on a major overhaul to the city’s existing transportation commission/committee structure that would see the dissolution of all seven of the existing commissions/committees/subcommittees (and their up to 54 members) and replace them with two new bodies: the Transportation Policy and Planning Board and a Transportation Commission. While I support the efforts to bring together the different elements of our transportation system, I’m not convinced of the wisdom of splitting transportation policy and planning from operations and implementation. I think there is tremendous value in having the policy and planning decisions driven off of the real life issues that are identified and addressed through operations and implementation. I’m also concerned with the massive cut to the number of citizen members and the negative impact that would have. Another major concern, is that the current proposal eliminates all mode-specific commissions (Transit and Parking & Pedestrian/Bike/Motor Vehicle) along with all requirements to have membership that represents users of transit or bikes or walking or the disabled. These are major concerns that require significant deliberation before moving forward. And yet in some ways, this massive proposed reorganization of our committee structure pales in comparison to the issue of whether or not the city should fill its long vacant Director of Transportation position. This position has been vacant for well over a decade and many of the issues identified by this body would be directly addressed by filling this position. There was compelling public testimony along those lines from former alders Robbie Webber and Satya Rhodes-Conway who both made strong arguments for the importance of filling this critical leadership position. The members of the ad hoc committee seemed to hear the message clearly and will continue to debate the question at their next scheduled meeting on 2/6. On Thursday, the Long Range Transportation Planning Committee met and voted to recommend approval of a resolution calling for Establishing Goals for Regional Transit Authority Legislation. This resolution describes the city’s intent to work with surrounding communities to define how an RTA might be structured with the ultimate goal of gaining approval from the State at a later date. An RTA would provide the needed funding to continue to regionalize Metro to more fully connect with surrounding communities outside of the city limits. Madison Bikes closed out the busy week with our board of directors retreat where we focused on strategic planning for 2017. Watch for more details around opportunities for membership, new events, and more focused work on advocacy. If you’re interested in getting involved, head to our website and drop us a note. Tuesday: Consider attending this talk by Global Health Institute Assistant Scientist Jason Vargo and Research Fellow Maggie Grabow entitled Helping Cities Quantify the Health Benefits of Active Travel (4:30pm) or find out more about how a new parking garage on East Main Street will accommodate bikes and impact travel at the Cap East Parking Structure Design Open House (5pm). For Eastsiders, there’s a public input session to develop a Cottage Grove Road Activity Centers Plan at Olbrich Gardens (6:00pm). While it’s not a transportation specific plan, it’s important to have the needs of cyclists represented for these land-use/development/neighborhood plans. Wednesday: On Wednesday, the Madison Area Transportation Planning Board meets to review the draft Regional Transportation Plan. This is nearing completion and will likely start its rotation through city committees soon. Friday: Kick off Madison Bike Winter Week with the Frozen Assets fat bike race. Saturday: Winter Bike Week continues with a Family Music at the Cargo Bike Shop and the Capital Goldsprint Series at Motorless Motion Bicycles. Check out all the Bike Winter events here on website or RSVP on Facebook, including the Monday morning commuter station on 2/6 in front of Machinery Row.